Join Canada’s Largest Start Line! The Vancouver Sun Run is Canada’s largest 10K road race. Run through a beautiful scenic course that highlights Vancouver’s downtown core at Burrard Street and Georgia Street, the world famous Stanley Park, and Cambie Street Bridge for the final stretch across the bridge to the finish line. 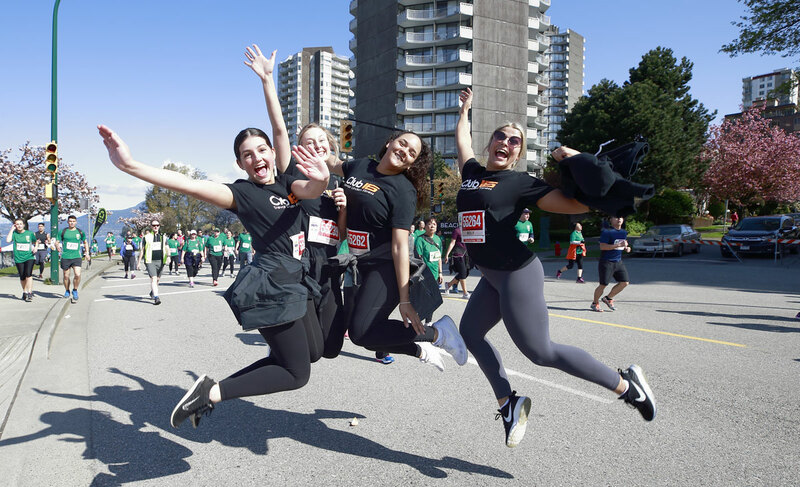 Your Vancouver Sun Run experience does not end just outside our host venue, BC Place Stadium; you are encouraged to enter the stadium to enjoy the wrap party along with your family and friends. Celebrate your achievement with live entertainment, the Kids’ Zone, an awards’ ceremony and refreshments. Sign up for race day details and stay informed. Team Building, Camaraderie and Fun! Create a team of 10 (or more) and join other companies, clubs and associations in promoting health and wellness among employees and friends. It is time to boost your club or school’s spirit and encourage physical activity among the group. Join over 4,000 youth runners celebrating health and fitness at Canada’s biggest start line! Register your Youth Team today! If you prefer a shorter course than the 10K, or if you’d like to get the whole family out together, then the Shaw 2.5K Mini Sun Run is the perfect route to take! Show your kids that fitness is fun by signing them up for one of Vancouver’s premier family events. Package Pick-Up for the Individual and Mini Sun Run will be on April 13th and 14th! Learn more about picking up your package by clicking the button below! CLICK HERE FOR PACKAGE PICK-UP INFO! Sign up to receive news on all our events. We won’t spam you. Come on down to the Sun Run Fair, happening now at @bcplace! Thanks to all the runners who donated their gently-used clothes at the @VancouverSunRun this morning. Great shot of the stretch along English Bay.